Taco Bell, the maker of all things "loco," "supreme," and "bellgrande," announced Thursday it will launch what could be its "biggest food creation" ever during this year's Super Bowl -- but they won't tell anyone what it is until the 30-second commercial airs in the game's first quarter. In fact, the press release about the mysterious new menu item is mostly redacted. 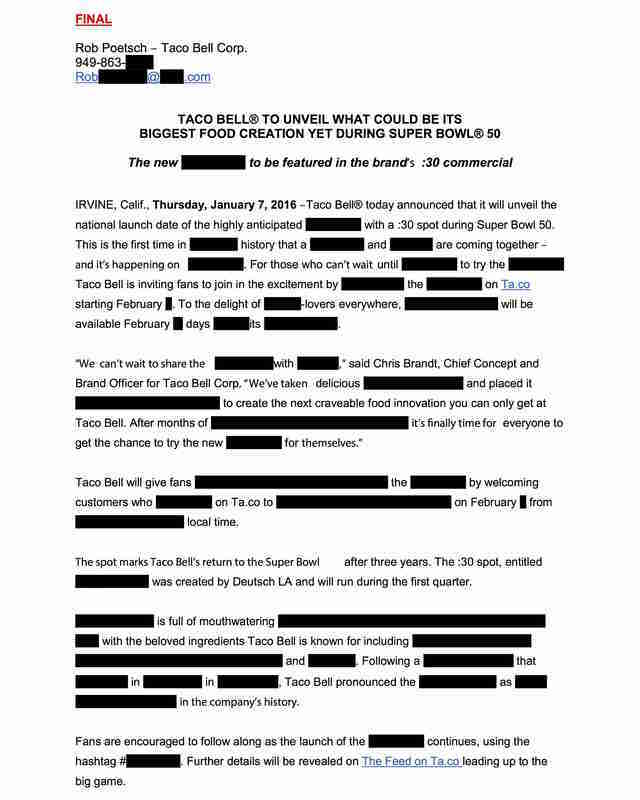 "Taco Bell today announced that it will unveil the national launch date of the highly anticipated [redacted] with a :30 spot during Super Bowl 50," the release states. "This is the first time in [redacted] history that a [redacted] and [redacted] are coming together -- and it’s happening on [redacted]. For those who can’t wait until [redacted] to try the [redacted] Taco Bell is inviting fans to join in the excitement by [redacted] the [redacted] on Ta.co starting February [redacted]. To the delight of [redacted]-lovers everywhere, [redacted] will be available February [redacted] days [redacted] its [redacted]." From the sound of it, Taco Bell appears to have combined at least two things into some sort of monstrous food hybrid, like the Quesarito (a burrito + a quesadilla), but bigger. So what could that possibly be? A Crunchwrap Supreme inside of a quesadilla, (a "Crunchadilla")? Or maybe they've created a more unexpected combination with something else entirely. Obviously, we're hoping it involves the beloved Grilled Stuft Nacho coming back. 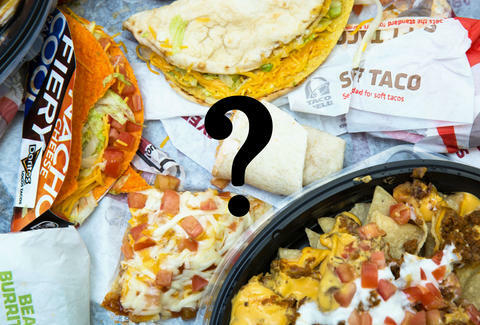 Taco Bell said it will reveal "further details" about the food creation in the days leading up the February 7th game on its blog. In the meantime, what's your best guess? Tony Merevick is Cities News Editor at Thrillist and just hopes there are enough antacids in the world to save us. Send news tips to news@thrillist.com and follow him on Twitter @tonymerevick.